Popliteal Fossa is a diamond-shaped hollow found on the rear side of the knee joint. When the knee is bent it becomes relevant. As it gives passage for primary vessels and nerves from the thigh to the leg , this fossa has great anatomical significance. Inferomedially: Medial head of gastrocnemius. Inferolaterally: Lateral head of gastrocnemius supplemented by the plantaris. 1. The popliteal surface of the femur. 2. The capsule of the knee joint and oblique popliteal ligament. 3. 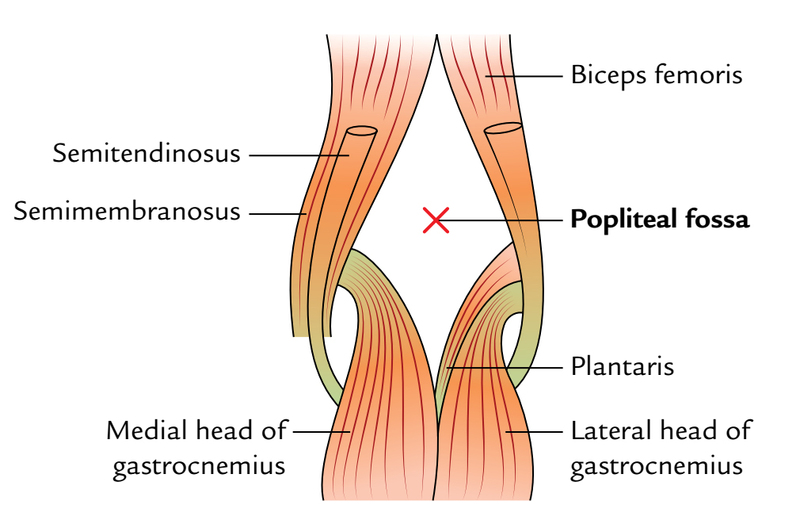 The popliteal fascia covering the popliteus muscle. 2. Three cutaneous nerves: (i) terminal part of the posterior cutaneous nerve of the thigh. (ii) posterior section of the medial cutaneous nerve of the thigh. (iii) sural conveying nerve). The roofing is pierced by all these structures with the exception of the posterior section of medial cutaneous nerve of the thigh. Posterior cutaneous nerve of the thigh (terminal part). Descending genicular branch of the obturator nerve. Terminal part of short saphenous vein. 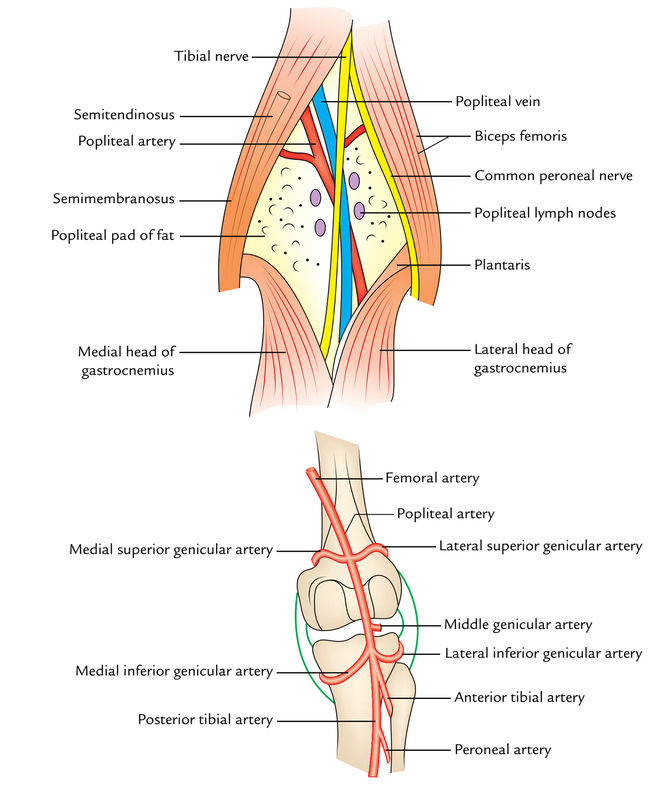 In the upper part of the fossa from the lateral to medial side, the order is Nerve, Vein, and Artery (NVA). In the middle part of the fossa from superficial to deep, the sequence of arrangement is Nerve, Vein, and Artery (NVA). In the lower part of the fossa from the lateral to medial side, the sequence of arrangement is Artery, Vein, and Nerve (AVN). It’s the continuance of femoral artery. It starts at the adductor hiatus (an osseo-aponeurotic opening in the adductor magnusat the junction of middle one-third and lower one-third of the thigh), crosses the floor of popliteal fossa from the medial to lateral side to reach the lower border of the popliteus where it ends by dividing into anterior and posterior tibial arteries. 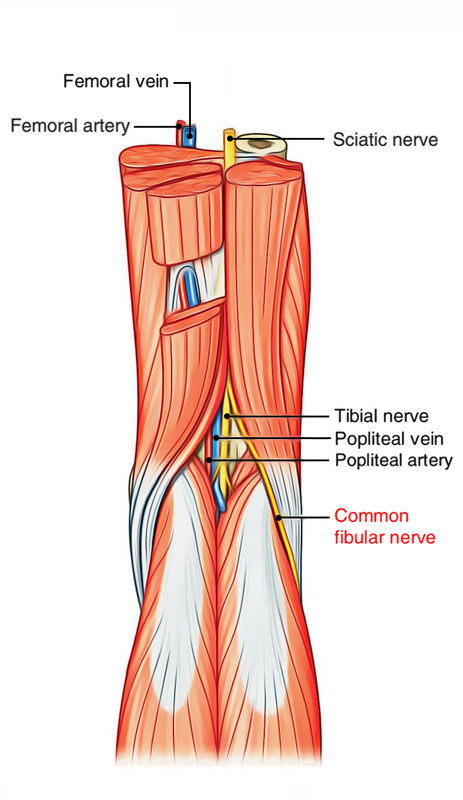 The popliteal vein is composed at the lower border of the popliteus by the joining of veins (venae comitantes) accompanying the anterior and posterior tibial arteries. It ascends superficial to popliteal artery and crosses it from the medial to lateral side in the popliteal fossa. The popliteal vein continues as femoral vein at adductor hiatus. It’s the bigger terminal branch of the sciatic nerve. It goes vertically downward from the superior angle to the inferior angle of the popliteal fossa. It crosses popliteal artery superficially from the lateral to medial side with popliteal vein interceding between the artery and nerve. It’s the smaller terminal branch of the sciatic nerve. It appears in the popliteal fossa below the long head of the biceps femoris and inclines downward and laterally along the medial side of the tendon of biceps femoris up to the lateral angle of the fossa. Here it crosses superficial to the plantaris, lateral head of gastrocnemius to get to the rear of the head of fibula. Ultimately, it winds around the posterolateral aspect of the neck of fibula, pierces the peroneus longus muscle, and ends by dividing into deep and superficial peroneal nerves. 1 node is located at the junction of small saphenous vein and popliteal vein. Few nodes are located deep to the popliteal artery. Staying nodes are situated on either side of the popliteal artery. Rear and lateral side of calf of the leg. Lateral side of heel and foot. It pierces the fascial roof about the middle of the popliteal fossa and gives cutaneous innervation up to the middle of the rear of leg. It’s the continuance of the posterior section of the obturator nerve. It first runs on the posterior surface of the popliteal artery and after that pierces oblique popliteal ligament to provide the capsule of the knee joint. Popliteal pulse: To sense the popliteal pulse, first bend the knee to rest the popliteal fascia. Then put the fingertips of both hands in the popliteal fossa with thumbs resting on patient’s patella. Popliteal pulse is the most challenging pulse to sense amongst all the peripheral pulses. Popliteal aneurysm: The popliteal artery is more susceptible to aneurysm than every other artery within the body. Medically, popliteal aneurysm shows as a pulsatile midline swelling in the popliteal fossa. Baker’s cyst: It’s cystic swelling which takes place in the popliteal fossa because of inflammation of synovial bursa underneath the tendon of semimembranosus or protrusion of synovial membrane of the cavity of knee joint via the fibrous capsule of the joint.